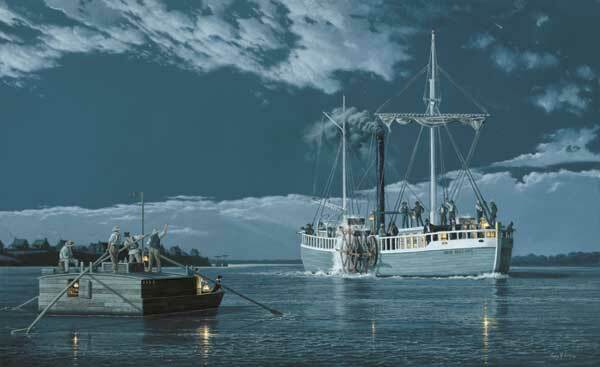 The New Orleans arrives in Louisville, painting by Gary R. Lucy. The New Orleans passed Madison and Hanover (where Hanover College now is) about mid-day of October 28, reaching Louisville in the evening of that day. On October 30, Lydia gave birth to their son, Henry Latrobe Roosevelt. Just beyond Louisville was a series of dangerous rapids, the Falls of the Ohio. Because the rapids could only be passed when the river was high and only with a relatively flat-bottomed boat, they were the most significant impediment to steamboat traffic on the Ohio and Mississippi Rivers. After waiting several weeks for the river to rise enough to risk the passage, the New Orleans made it over the Falls on December 8.